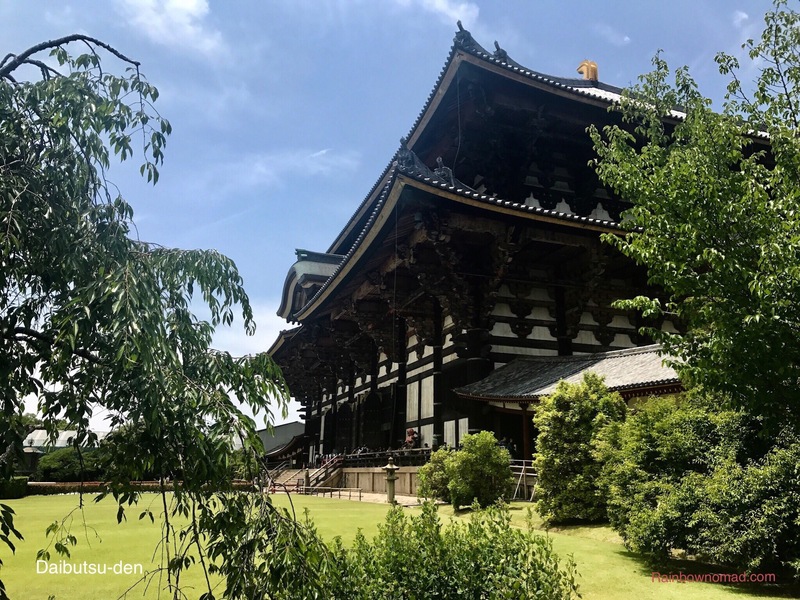 Nara is renowned for its giant bronze Buddha, Daibatsu but little did I know Nara Koen or Park, where it sits, is also famous for sacred deer. We set off from Kyoto on the Japan Rail (JR) line to Nara, about 30 minutes south east. Exiting the very modern train station I again insisted on my hard copy map, even though Ms Tech Savvy had brought the portable wifi. This map was later to prove my downfall. 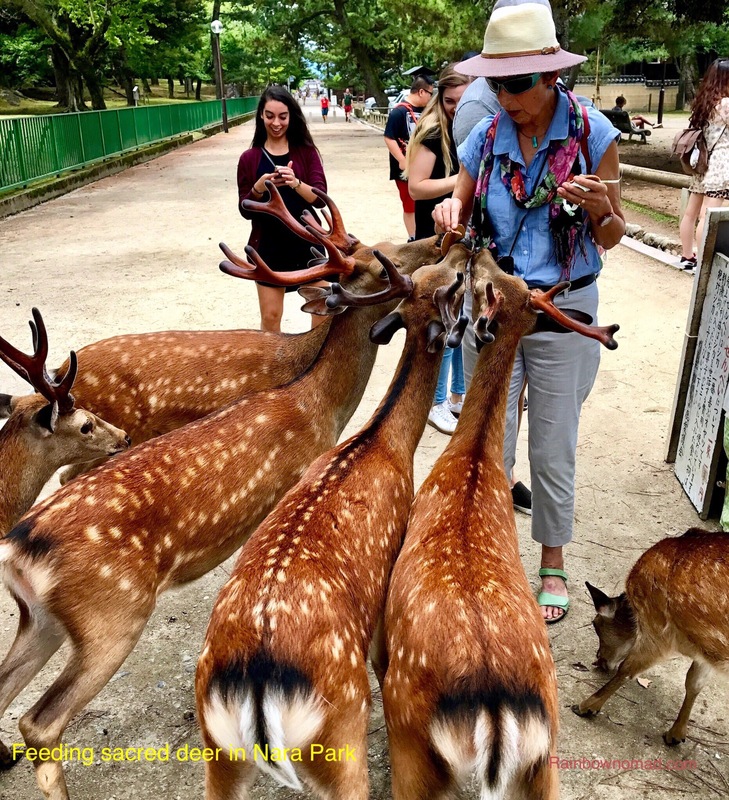 The fabulous wide streets of Nara are lined with tasteful gift shops and small cafes. 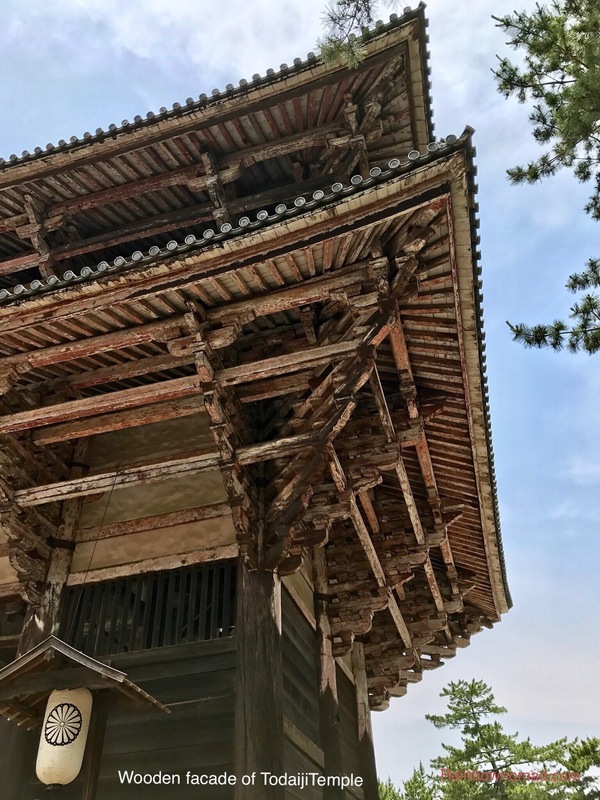 But the helpful tourist guide at the station had circled on our map the Kofuku-Ji Temple with its 3 and 5 story pagodas as our first stop. 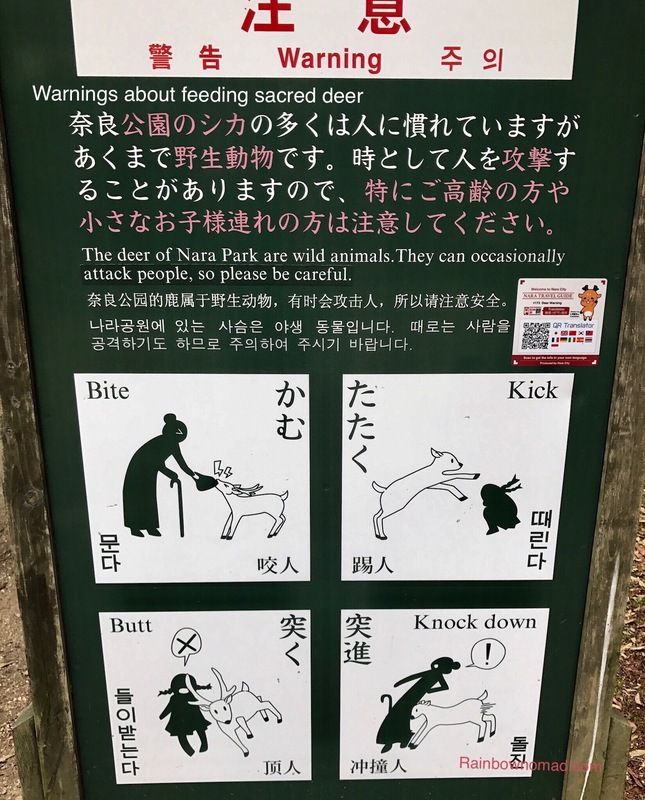 We wandered along through the park and pine and cyress trees, admiring the beautiful deer and their offspring and ignoring the signs warning us of impending doom. I even bought some deer biscuits and once the wrapper was off, so was all manner of cuteness. One large horned creature, ignoring my pathetic attempts to shoo him and his mates away, grabbed hold of my pocketed map and wrenched it out, slobbering all over my pants and ripping the pocket. The map was finally rescued but from then on I kept a respectful distance. 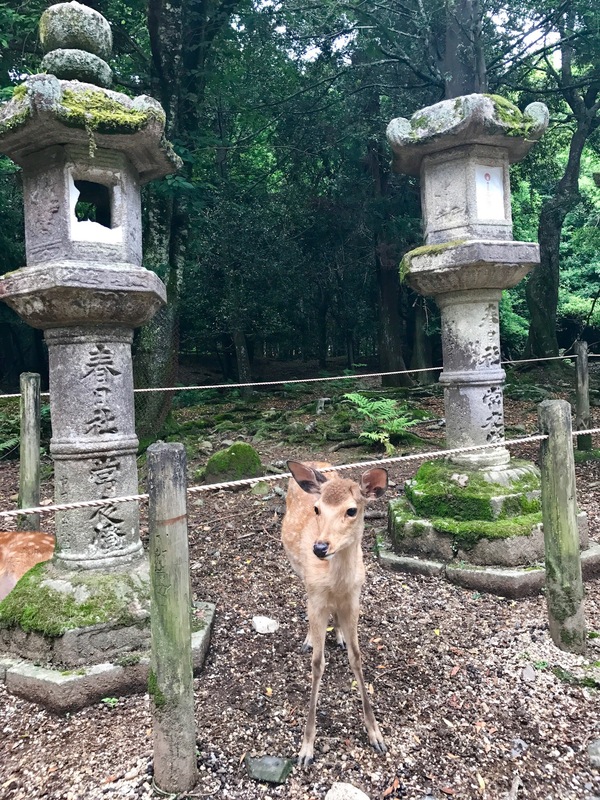 Nara is really a Buddhist stronghold and in 710 became the first permanent capital of Japan. 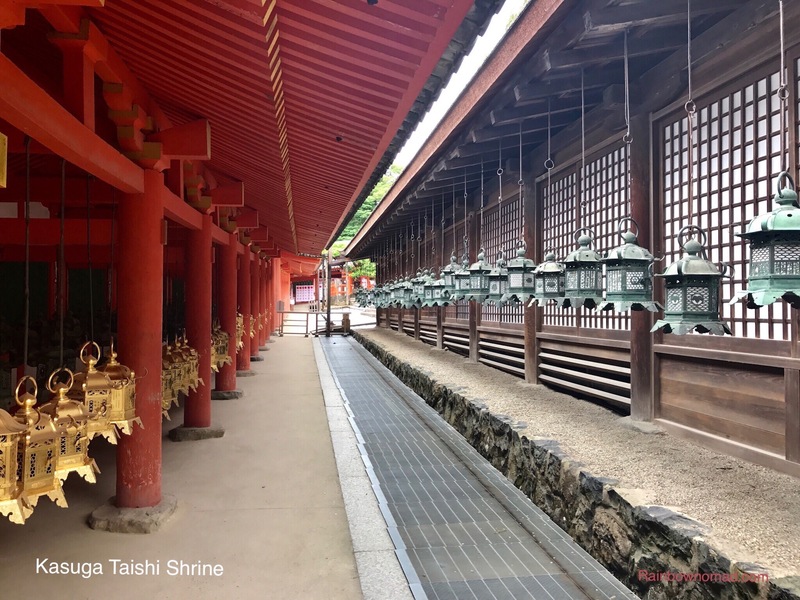 It was at this time that Chinese influences brought religion, art and legislative principles to Japan and Buddhism rivalled Shinto as Japan’s main religion. 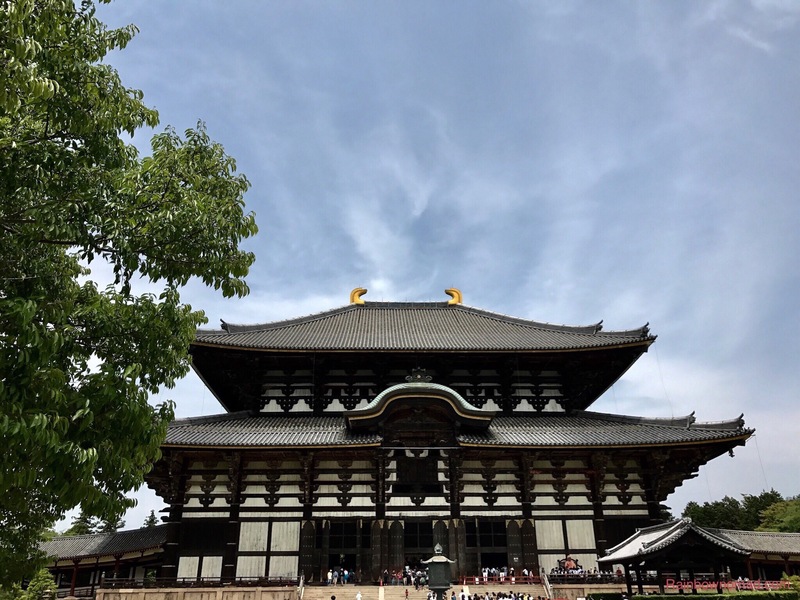 During the 8th century there were plagues and earthquakes, so the Daibutsu-den or temple was built to house a bronze Buddha, as protection for the population. The current Daibutsu weighs 500 tonnes, is 14.98 metres tall. Originally it was covered in gold leaf but even the raised hand is 2.5metres high. Entering the main hall and standing in thrall of this huge figure is quite overwhelming. The hundreds of people streaming through however made it a less contemplative place then the beautiful gardens outside. We entered the Todai-Ji complex which houses the Daibutsu-den and were shown to the entrance by an elderly lady volunteer guide. She explained that the marble entrance paving was stone brought from India, China, Korea and finally Japan, working from the inside out, as that was how Buddhism arrrived in Japan. 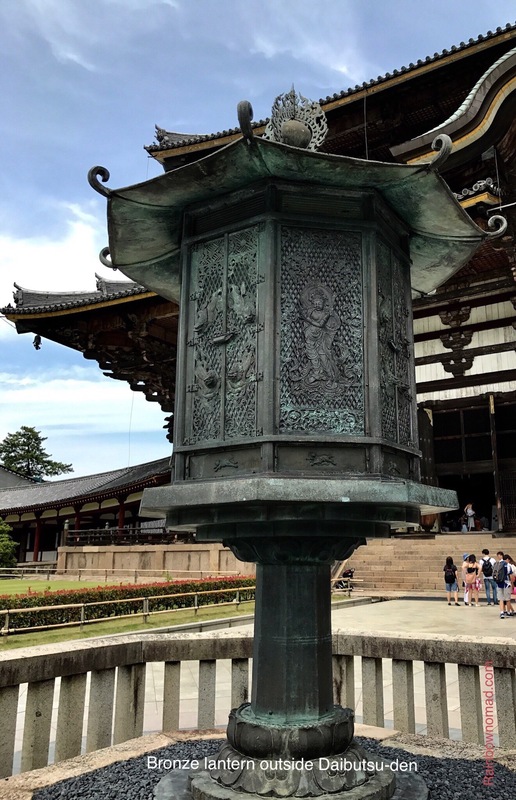 A beautiful bronze lantern standing in front of Daibatsu-den is the only building or statue that remains from the 8th century. It is cast in bronze, with carved figures of goddesses and script. 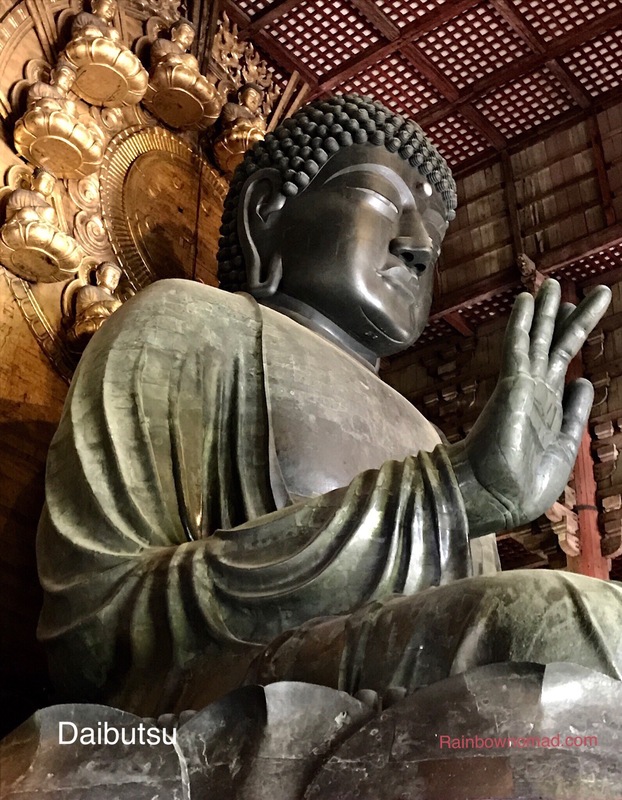 The Buddha and many of the buildings have been destroyed by earthquakes or fire, although the current Buddha is from the 14th century Edo period. 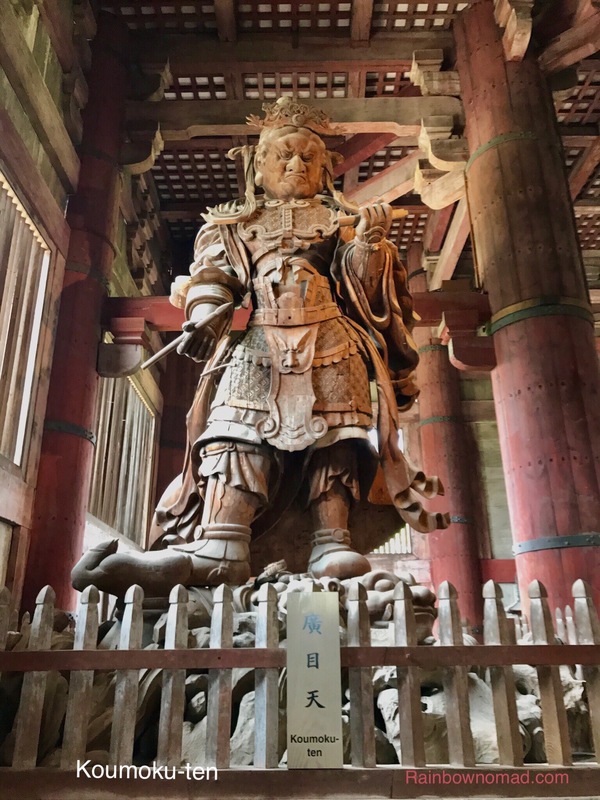 The huge carved wooden guardians Komotu-ten (Lord of Limitless Vision) and Tamon-ten (Lord who Hears All) are some of the largest wooden carvings in the world. 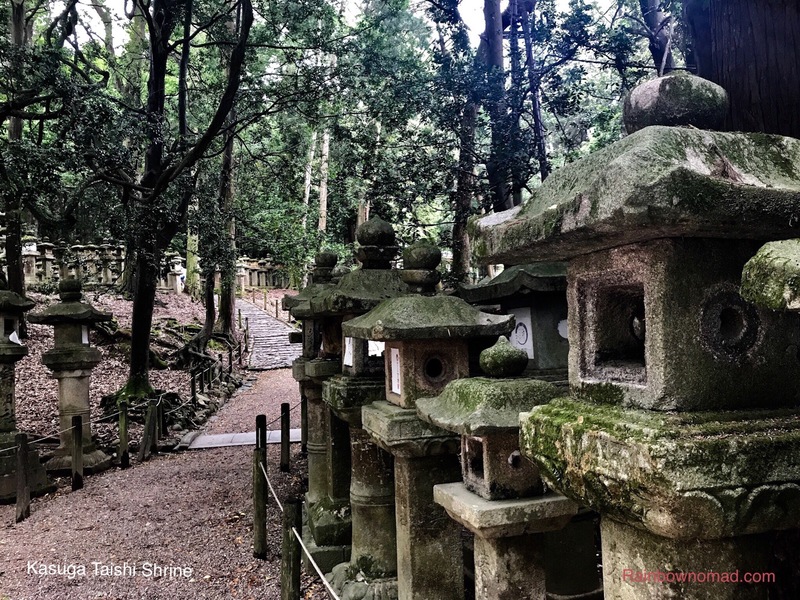 We wandered up the hill to Nigatsu-do Temple along with hundreds of school children, many hell bent on completing their English language assignment on unsuspecting tourists. An incredibly frail lady entered into the temple, first bending excruciatingly low to make sure her empty shoes were facing away from the altar, and then knelt and rhythmically beat a small drum with her husband as the monk inside chanted. 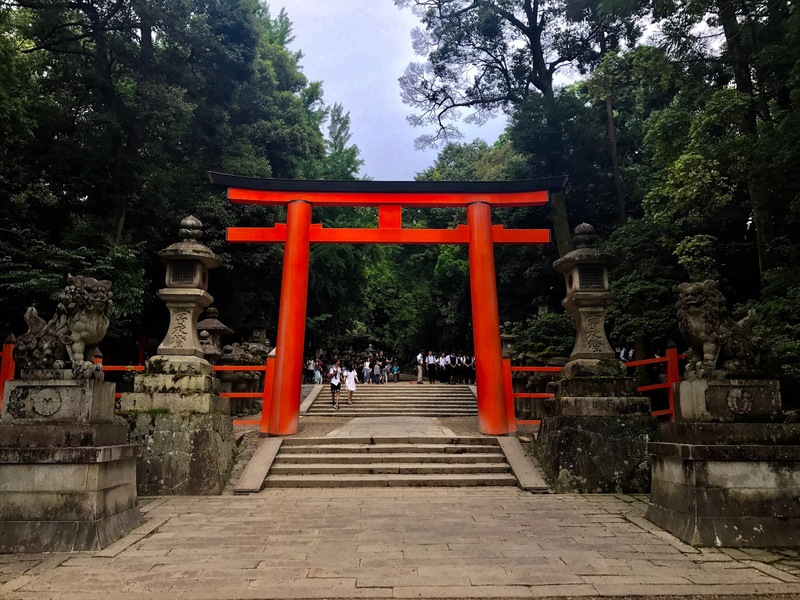 Our final destination was the Kasuga Taishi Shrine with its hundreds of lanterns and beautiful torii. We wished the sacred deer farewell and wended our way back to the train. Really enjoying the travelogue, Sue. You are a master of the Japanese names. What wonderful memories of your experiences which you and Mia can share for years to come. To Mia, Miss Tech Savvy – go girl! !